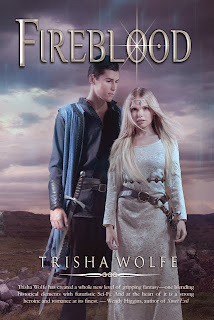 Two warnings come to mind when I think back to reading Trisha Wolfe's Fireblood. 1. Give the book a few chapters. 2. Don't start reading 20 minutes before bed! I started this book exactly 20 minutes before bed, an important time in a house with a 4 month old, and my husband sleepily grinned at me when I finally crawled into bed with half the book finished still muttering to myself trying to figure things out with half the book to go. First, things I loved. I loved the characters in this novel. Each character was solidified in their secrets, many of which weren't revealed until the end (a point Zara herself makes). This made for characters I found myself drawn towards as their different dimensions took shape. I love characters with depth and will overlook a multitude of deficiencies if I can connect with the characters. Between Zara, Devlan, Xander, Fallon, even Cecily I had a plethora of characters continually drawing my interest as I attempted to piece together then end game as chapters raced by. Did they ever race by! Hence, the second thing I loved, the plot. I hate reviews that give away the ending so I endeavour hard to be subtle. Fireblood takes place long after a modern day war has devastated the earth, and the plot centers on a small (I can't figure out an estimate but I'm terrible with spacial sense) settlement named Camelot ruled by the elusive King Hart who has fashioned his utopia through fear and a heavy hand. Zara, our commoner heroine has been hand picked to marry the Prince, a young man named Sebastian who may or may not share his father's harsh tendencies. All in all I thoroughly enjoyed this read and look forward to seeing what else the author has in store. I would highly recommend this novel to anyone looking for a good read in this genre.